The EPA (Environmental Protection Agency) warns, “Molds have the potential to cause health problems. Molds produce allergens (substances that can cause allergic reactions), irritants, and in some cases, potentially toxic substances (mycotoxins).” and, “Molds gradually destroy the things they grow on.” Mold spores tested in EnviroScreening Lab, the NORMI™ approved lab, include the more common forms as Aspergillus, Chrysosporium and Penicillium and the more uncommon and dangerous molds as Stachybotrys, also known as “Black Mold.” Many times it is discovered that once mold is removed conditions continue to exist that encourage it to return. NORMI™ ‘s goal was to create a protocol that identifies the level of mold contamination, completely and certifiably remove it and then provide a maintenance program that can maintain a “Mold-Free”* environment. This program is an industry first. 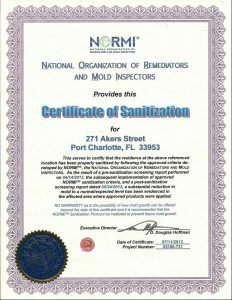 Homes and buildings treated for mold contamination with one of NORMI’s certified protocols can be approved for a Certificate of Sanitization™. Building owners can now be assured that at the completion of the remediation process the mold contaminating their building has been effectively removed and the building environment tests show the environment to be at expected/normal limits. It’s a reasonable approach. Documentation is now available to building owners from NORMI™, a non-profit independent agency, which serves as a certifying/training institution throughout the United States specializing in indoor environmental problems and their solutions. The NORMI™ main office is in Abita Springs, Louisiana, a suburb of New Orleans, with an additional office in Tampa, Florida. NORMI™ has provided technical classes that certify Mold Inspectors and Mold Remediators in 40 states. What distinguishes NORMI™ from like institutions is its commitment to developing programs that provide greater indoor environmental solutions and long-term protection through a support process of continuing education. This allows NORMI™ members to stay current with this very dynamic industry. As a result, NORMI™ has developed the most comprehensive mold removal protocols in the industry and is setting the standard nationwide for such protocols. Because these are very effective in removing mold, NORMI™ has arranged that a building treated with one of the approved protocols could be certified “free of mold contamination” at the time the remediation was completed. The value of this documentation cannot be over estimated. In the future when the building is offered for sale the Certificate of Sanitization™ can provide crucial documentation of the building’s condition. For example, in New Orleans the mold contamination after Katrina could hardly have been worse. When a property is put up for sale, the first question is, “How did you clean up the building after Katrina?” Now the perfect solution and “mold-free” confirmation is available to qualified remediation projects. Five years down the road when EVERYONE will know what NORMI™ members know now about the ineffectiveness of bleach as a sanitization solution, potential buyers will want to know that the house they are about to purchase was cleaned properly, using the right kinds of chemicals and protocol. NORMI™ has paid special attention to designing its mold removal protocols so they utilize the best known, scientifically proven processes, have redundancy to insure total removal and are evaluated for comprehensiveness. This is comparable to a cancer surgery patient, who subsequently undergoes chemotherapy to insure all cancer cells are dead followed by lab tests to prove the procedure was effective. The design criterion of the NORMI™ Protocol was developed with five objectives in mind. These are referred to as the “NORMI™ Five-Step Protocol” and can be applied by a NORMI™ trained and certified independent contractor. Pre-Screen the building to determine the extent of mold contamination. Select an appropriate NORMI™ approved process that will completely remove air and surface mold from the building. Apply a NORMI™ Approved inhibitor and/or protectant to all surface areas to help prevent future mold contamination. Conduct post-screening of the sanitized/remediated area to insure the mold contamination was removed. After finding the project coordinator’s records in order, NORMI™ will issue to the property owner a NORMI™ Certification of Sanitization™. This is the easiest part. NORMI™ provides a list of Certified IAQ/Mold Inspectors and Certified Mold Remediators in your area who are properly trained in these protocols. They can evaluate your mold concerns and, if remediation is needed, can perform a NORMI™ certified protocol that will completely remove the mold contamination. You may contact them through the website in the PRO LOCATOR. CAN “MOLD-FREE” LIVING BE MAINTAINED AFTER REMEDIATION? Again, YES. NORMI™ provides a 36 point program (called the Sanitization Protocol in Chapter Ten of “Mold-Free Construction”) that guides the home or building owner in a sensible and easy program to insure that mold does not return to unacceptable levels. You can live in a “mold-free” environment with NORMI™ as your partner! * The term “Mold-Free” refers to the concept of keeping indoor mold levels, either invisible or visible mold, to levels considered “expected/normal”. The sanitization process refers to lowering microbial population in an indoor environment and does not imply a “sterile” environment. Your NORMI™ CMI/CMR can explain to you the difference.